Unlimited consulting sessions via phone, skype, or e-mail to make your inspiration a reality. 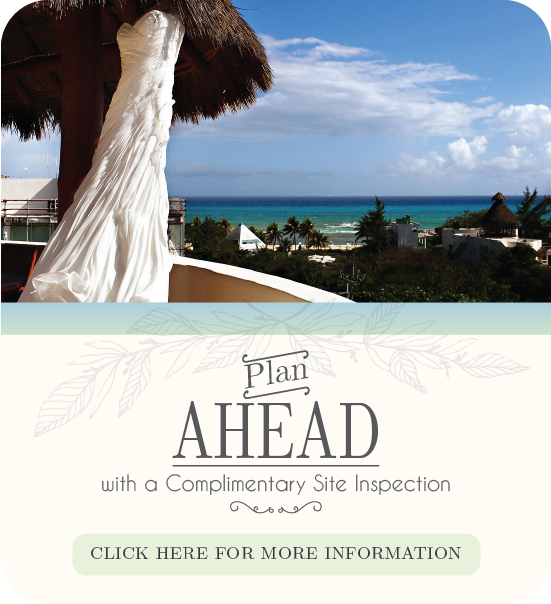 Personalized site inspections in the Riviera Maya. Wedding venue comparisons by budget, video and photo galleries. Meet and confirm officiator and vendor proposals and contract for your room accommodations, entertainment, floral, décor, cake, photographers, videographers, ground transfers, booking hair/spa appointments, etc. Assist in prioritizing your budget, planning and event timeline. Verify deposit and payment schedules while assuring international transaction are secured. Assist with ceremony and reception layout and diagram. Managing your rehearsal ceremony, final reception and/or ceremony. Receive special amenities for the couple and guests. Discuss wedding etiquette issues and take care of any issues that may arise. One contract to organize your entire event. Valued relationships with a team of vendors offering a variety of styles and décor to make your inspiration a reality on your wedding day. Be the on-site contact while guests are making their international travel plans and handle any special requests. Solve any challenges that may arise prior, during and after the event so you can enjoy your time at your destination wedding. Offer complete legalization of Mexican Documents for your Mexico Legal Ceremony. Looking forward to planning your destination wedding in Condo Hotels!